Saturday morning (7/18): Christina and Steve Campo have abandoned their Transpac effort and are returning to LA. The Transpac tracking system tells the story. 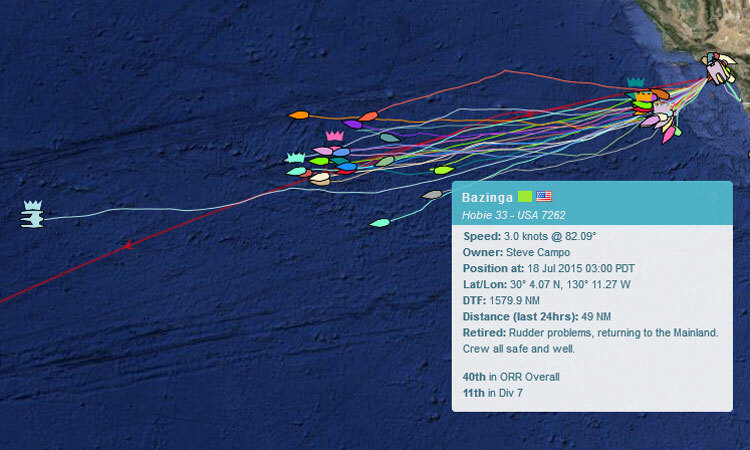 Their lime green icon is pointed back at the mainland while the rest of the competitors are moving toward Honolulu. The brief description explains that they had a problem with the rudder on their Hobie 33, but the crew is safe and well. They were moving at a reduced speed of just three knots. You can follow their progress here. Look for the boat Bazinga. The tracking snapshot on Saturday morning (six hours delayed). That three-pronged object way out in front is the trimaran Lending Club 2, which was not in the race but has now finished, setting a new speed record for the trip of three days, 18 hours, knocking a day off the record. The next wave of fast boats can be seen just off the California coast, but on Saturday morning they were caught in light air and were moving slowly. 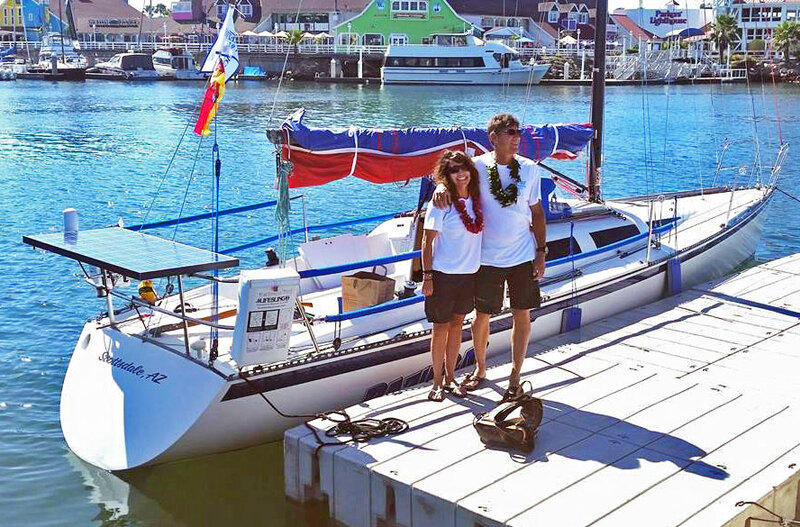 Christina and Steve Campo moments before they shoved off for a little sail to Honolulu in Transpac 2015. Unfortunately they won’t be getting leis in Hawaii. July Meeting: Who is Scot Tempesta and How Can He Say Those Things? Ready for Some Kool Kinnikinick Kamping?